The Canon EOS Rebel T5i / 700D delivers 18 megapixels of professional grade image quality in a compact, lightweight, feature-filled, easy-to-use body that carries a very affordable price tag. These are the qualities that have anchored the flagship Canon Rebel model in the top-selling DSLRs category for years and will do the same for the Rebel T5i. New textured finish for a "classier look"
360° rotation mode dial with a "more luxurious feel"
While some of the upgrades are nice (the new texture for example), I doubt that anyone is going to upgrade from a T4i to a T5i for them. Or pay more for the T5i while the T4i remains available – with perhaps one exception – that new kit lens. I recently reviewed the new Canon EF-S 18-55mm f/3.5-5.6 IS STM Lens and indeed found it to be a solid upgrade (primarily in the AF system) from the previous kit lens (the Canon EF-S 18-55mm f/3.5-5.6 IS II Lens). I don't see a new kit lens justifying a new camera model as the 18-55 IS STM could certainly have easily packaged with any other camera already available, including the T4i. 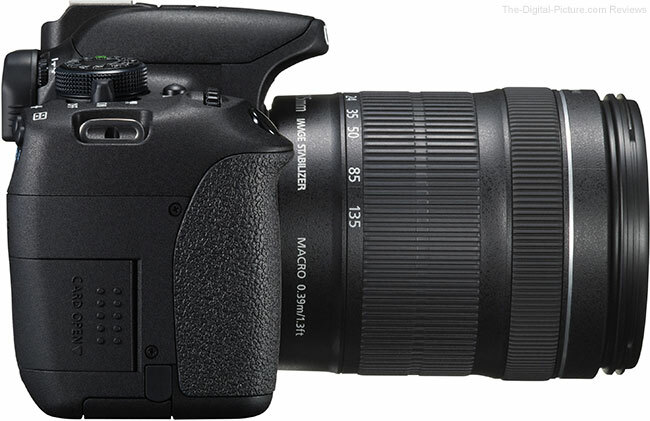 But you must buy the 18-55mm STM lens separately if you purchase the T4i. 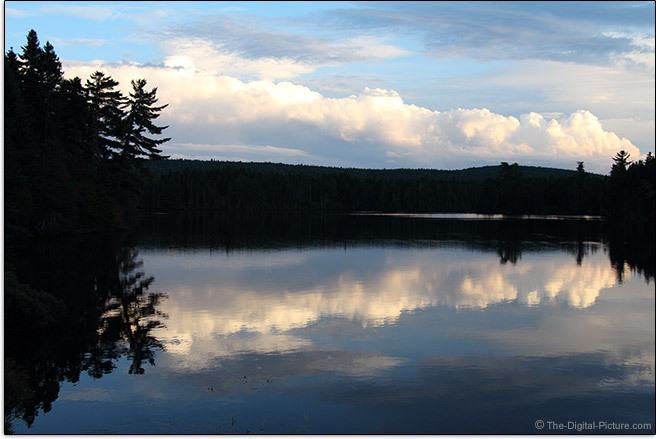 The T4i sample image above was captured at Island Pond in the North Maine Woods using a Canon EF-S 18-135mm f/3.5-5.6 IS STM Lens. Settings were 24mm, f/8, 1/80 and ISO 100. 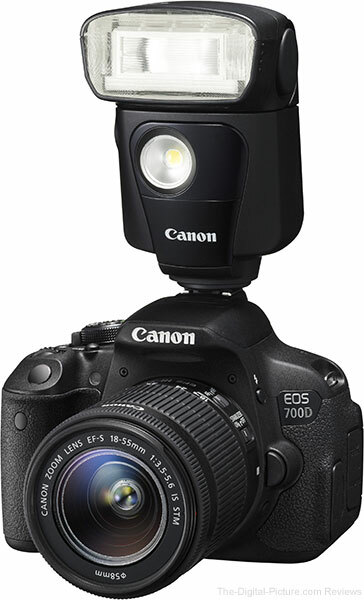 The Rebel T5i, otherwise named "Kiss X7i" in Japan and "700D" in Europe/Asia/Oceania, is the 10th 3-character Canon Digital Rebel model (including the Rebel SL1/100D). Including the low-end Canon EOS Rebel XS/1000D and Canon EOS Rebel T3 / 1100D, the T5i/700D is the 12th Rebel model produced by Canon. As you probably guessed, the Canon Rebel camera line is very mature. The T4i is a great camera and the T5i has that same greatness built in. Like the rest of Canon's recent DSLR cameras, the T5i/700D has received a very high resolution 18MP sensor. The Rebel T5i has received the identical sensor and imaging pipeline present in the T4i. 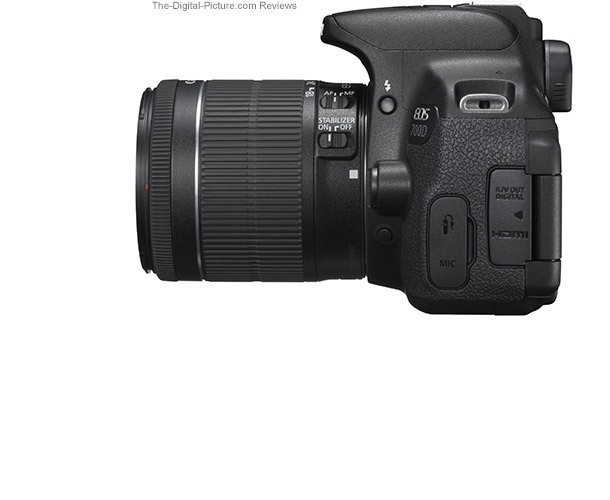 You can see the T5i's resolution by viewing the Canon EOS T4i/650D image quality using the site's tool. On that page, you can compare this image quality with other Canon DSLRs. 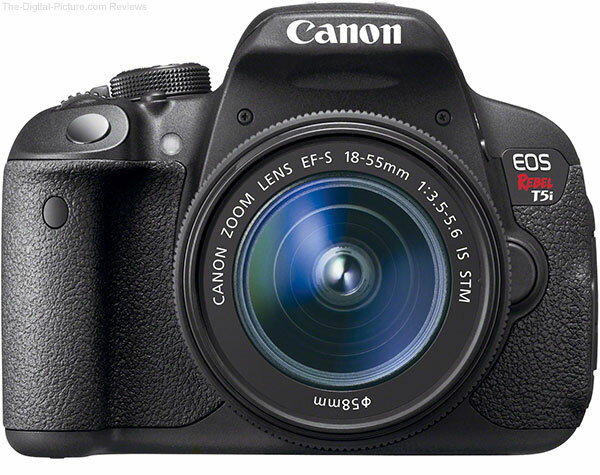 The recent 18mp APS-C (1.6x) cameras including the T4i, EOS M and Rebel SL1 have sharpness increased by default. Click on the color block image below to view a pair of image comparisons between several current-at-review-time DSLR cameras. This comparison was previously featured on this page, but later moved to its own page to avoid (especially for mobile users) the large file download required. 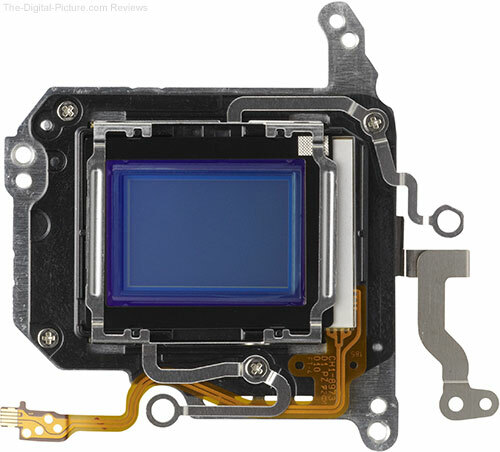 If you read the image quality discussion on that page, you can skip down to the image sensor image. While these comparisons are primarily designed to show noise (and color), you can see the obvious difference in the T5i/T4i's sharpness compared to the other APS-C bodies including the T3i. As I said before, I welcome the increased sharpness, but increasing sharpness often increases the visibility of noise. You will see this when comparing the T4i to 60D. The set of T4i Sharpness=0 results were processed with a sharpness setting of 0. These results are very similar to the T3i's results, both in terms of sharpness and noise levels. Essentially, the T5i/T4i's image quality matches the T3i's when the same amount of sharpening is added to both. The T3i has great image quality, so matching this image quality is very good. In-camera noise reduction is standardly available in EOS DSLRs, and noise reduction is of course also available during post processing. The bottom three rows of results in the comparison above (and below) show examples of T4i noise reduction. All three NR examples utilized the Standard Picture Style in-camera with the default sharpness setting (so that the RAW NR results would match the JPG NR results). The default sharpening applied to these results examples the destructiveness of sharpening (look for halos around the low ISO color block examples). The noise reduction process is also destructive - I usually apply only light NR in my noisier images. Multi-Shot Noise Reduction is new for EOS - and I was quite excited to see how the merging of multiple (four) exposures taken in a full-frame-rate burst could be used to reduce image noise. The concept makes a lot of sense. The bottom two NR examples provide a direct comparison with the standard NR and the Multi-Shot NR. There is definitely improvement with MS NR - a full stop or more at some ISO settings - including lower ones. Some of the downsides to Multi-Shot Noise Reduction include: MSNR is currently available only with JPG output - I want this feature to be added to DPP for RAW capture - perhaps as another HDR preset? Multi-Shot Noise Reduction will not be so useful with moving subjects. Long exposure NR must be off to enable MSNR. The T4i reverts to Standard NR in Basic zone modes, during video recording, in Bulb mode and when the camera is powered off. Flash is not supported in MSNR mode. And the camera remains "busy" for a brief period of time after the 4 shot burst - while processing the merged image. New with the T4i was the highest-ever-in-a-Canon-APS-C-DSLR ISO setting of 25600. I find this setting is useful for marketing purposes only. But the Canon T5i now has this capability – in case you want to one-up your friends. ISO 12800 results are not pretty. Even ISO 3200 and above is best avoided on APS-C DSLRs right now, but 3200 and 6400 can be used for extreme situations - or when Multi-Shot Noise Reduction is used. Use the figures above to get a rough estimate of the size card you need. Of course, the JPG file format is significantly more storage space efficient and has selectable levels of image quality that also can adjust space requirements downward dramatically. My advice is to shoot RAW and buy lots of memory - it is cheap and the cards are useful for temporary archiving and backup use. The Rebel T5i utilizes SD/SDHC/SDXC cards for storage. The T5i supports the fast UHS-1 standard as well as the Eye-Fi wireless/memory combo cards. Overall, the Canon EOS Rebel T5i / 700D's image quality is impressive - good enough for professional-grade projects. I don't have any complaints - especially for the price of this camera. As I said back in the T3i review - it was not many years ago that we could only dream about this image quality - and would expect to pay many times the T4i's price for lower image quality. Proper exposure is important for a quality image and to this end, the T5i inherits the first-seen-on-the-EOS-7D 63-zone iFCL (Intelligent Focus, Color, Luminance) Metering System that takes focus, color, illumination and data from all 9 AF points into account when establishing the proper exposure. Metering modes are available: Spot, Evaluative, Partial and Center-weighted. Canon EOS DSLR Auto White Balance has been improved significantly enough that I now primarily shoot in auto white balance mode (though I often tweak white balance when post-processing my shots). Auto White Balance under tungsten lighting continues to be handled very well – and much better than ancestral EOS models. I've said it many times - if the shot is OOF (Out of Focus), the best image quality in the world is not going to save it. AF performance is very important (unless you are using manual focus of course). The Canon EOS Rebel Series DSLRs typically get Canon's entry-level AF systems (a sacrifice made to achieve the low price), but even entry-level Canon AF is still very good compared to other camera types. The biggest enhancement in the T4i was a new AF system which the T5i has now inherited. The T5i shares the T4i and 60D's AF sensor (above) that includes 9 cross-type AF points in a diamond pattern with a high-precision dual-cross center point that is activated when an f/2.8 max aperture or wider lens is mounted. The cross type AF points are sensitive to lines of contrast in two directions (instead of one), allowing AF to lock focus much faster in certain conditions. Prior to the flagship Rebels receiving the 9 cross-type AF points was the Rebel T3i with 8 horizontal-line-only sensitive AF points and a cross-type center point. With an f/2.8 or faster/wider aperture lens, the T3i's center point also functions with greater precision. Though not top-of-the-line, the Canon EOS Rebel T5i / 700D's phase detection AF is fast and accurate – based on my experience with the T4i of course. Let me emphasize "fast" for the healthy percentage of T5i owners stepping up from point and shoot models that left them frustrated because the moment they intended to capture would be gone before the camera could take the picture. 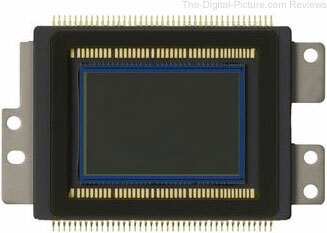 DSLR phase detection AF is a major upgrade from point and shoot contrast-detection AF. In one shot mode, focus accuracy has not been an issue with the prior Rebel models, Now, with the cross-type AF points, locking peripheral AF point focus is even easier with more challenging subjects. In AI Servo mode, all Canon DSLRs attempt to predictively focus the attached lens at the precise location the subject will be at the moment the shutter opens. The ability to accurately focus-track a subject rapidly approaching the camera is a differentiator between camera models. The faster a subject is approaching the camera and closer the distance is, the more taxing the situation is on AF - and the more out of focus shots you will likely experience with the even best lenses mounted. Canon's 1-Series cameras and the 5D III have the most advanced AF systems at review time. They are faster and far more sophisticated/configurable AF systems - if your income is depending on you getting the shot, these are the models you need to be using - a huge number of non-pros are using these models as well. The 7D and 70D also have better AF systems. When evaluating the T4i: I was hopeful that the T4i's new AF system would bring significant change in the AI Servo AF department, but in the live action testing I did using the center focus point only, my results were not so exciting. Even a child running a steady speed at distances well beyond frame frame-filling proved difficult for the T4i and Canon EF 300mm f/2.8 L IS II USM Lens I was testing with. There are an infinite number of AF situations to throw at a camera, but subjects moving parallel to the sensor plane typically pose much less of challenge for a camera. Shooting at narrower apertures results in more DOF that better-hides AF precision issues. Starter lenses tend to have these narrower apertures at even their widest aperture settings. The T5i receives the Hybrid CMOS AF system first seen in the T4i. 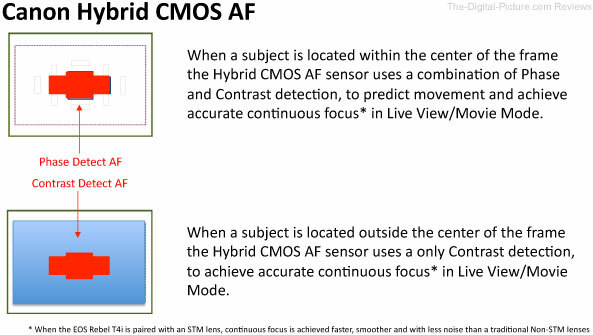 Hybrid CMOS AF uses the CMOS imaging sensor for both contrast (typically slow) and phase-difference detection (typically very fast) autofocusing methods simultaneously to provide fast and smooth (important for video) focusing. 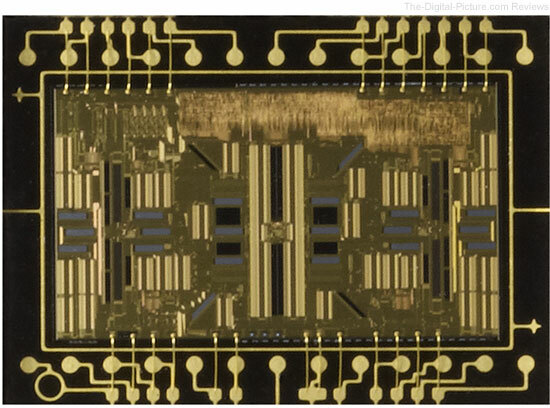 Included as part of the Hybrid CMOS AF system are phase detection AF points embedded within the image sensor itself. One Shot Live View focusing remains available, but Continuous AF in Live View is the feature recently added to Canon DSLRs and is what is needed for the relatively new video AF (called Movie Servo AF). The T5i has an improved Live View AF algorithm promising better and supposedly quieter performance over the T4i. Continuous AF is also available in still capture mode - to keep the lens pre-focused for quick image capture. Continuous AF options are Subject tracking AF, Flexi-Zone Single and FlexiZone Multi. Subject Tracking AF will attempt to keep the AF frame on a face (the T4i tracks faces very well) or other selected-via-touch subjects. Flexi-Zone Single allows selection of the focus point and FlexiZone - Multi AF utilizes one of 31 (or optionally 9) selectable zones for the AF frame location. The non-continuous-but-fast Quick Mode AF remains available (the mirror is lowered for conventional phase detection AF to take place). Live View Continuous AF (including Movie Servo AF) works with all EF lenses, but Canon states that it works more quietly and smoothly with a newly developed STM lens mounted. As of review time, this statement is indeed mostly correct. The three STM lenses available at review time are the EF 40mm f/2.8 STM, EF-S 18-55mm f/3.5-5.6 IS STM and the 18-135mm f/3.5-5.6 IS STM. The Canon EF-S 18-55mm f/3.5-5.6 IS STM Lens and Canon EF-S 18-135mm f/3.5-5.6 IS STM Lens focus smoothly and silently – and have silent image stabilization system. Both the 18-55 STM lens and the 18-135mm STM lens are very good lens choices for T5i video recording using continuous AF. As I noted in the Canon EF 40mm f/2.8 STM Lens review, the 40 STM is not a silent focusing lens. AF adjustments are easily audible through the on-camera mic. With Hybrid CMOS AF behind them, the Canon EF 24-70mm f/2.8 L II USM Lens and Canon EF 28mm f/2.8 IS USM Lens (and other similar lenses) quickly snap to close-to-correct focus and then relatively slowly step into precise focus. You can hear the AF mechanism of these lenses clunking into position in video recordings. Movie Servo AF, in its current state, is not going to be the choice of major motion picture studios. But, it is simple, it works and it will get used. As usual for Canon's non-1-Series bodies, the T5i requires a lens or lens plus extender combination with a maximum aperture of f/5.6 or wider (as reported by the lens) for the standard phase-detection AF to function. Going back to the video discussion ... Like all of the other modern Canon EOS DSLRs – and now obvious from the AF discussion, the T5i supports video capture. Video image quality, especially with the shallow DOF (Depth of Field) capabilities of compatible lenses, is very impressive for a camera at this price point. Especially when using careful setup and manual focusing, very impressive results are obtainable from this camera. 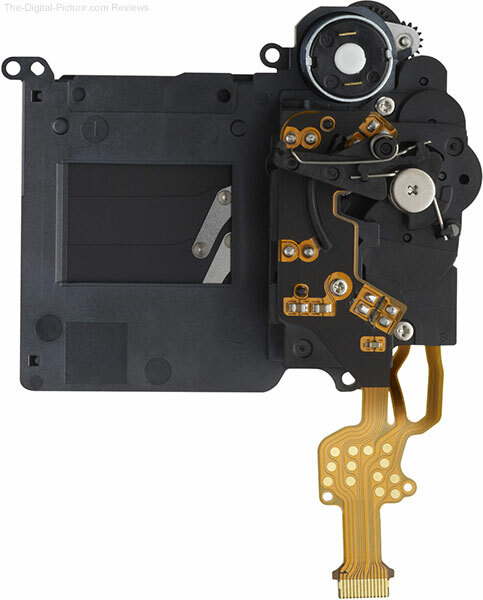 Here are additional video recording features and specs: Movie exposures are either Program AE or manual exposure. The ISO speeds up to ISO 12800 can be used for manual exposures. The movie file size is now unlimited (or limited by the card being used) - continuous HD recordings can be as long as approximately 22 minutes utilizing 4GB clips. Created are H.264-encoded .MOV files. A new built-in stereo mic captures good sound quality and a 3.5mm miniphone jack allows use of an external stereo mic. Audio gain can be automatically or manually set. An attenuator function reduces audio distortion in unusually loud sounds. Electronic wind cut filtration is provided. The Video Snapshot mode allows for two, four, or eight second video segments to be easily recorded and then combined or reordered in-camera. An integrated mini-HDMI port makes it easy to view the results on any HDTV. We'll look next at the physical camera, starting with the viewfinder. The first thing point and shoot users will notice when peering into the T5i's viewfinder is that it is surprisingly large and very usable. The first thing that 60D (or similar body) users will notice is that the T5i's viewfinder is very small. It is all about what you are used to, but the T5i continues the Rebel tradition of having a relatively small body size in part due to its relatively small viewfinder. The Rebel T5i also continues the Rebel tradition of using a pentamirror (instead of a pentaprism). 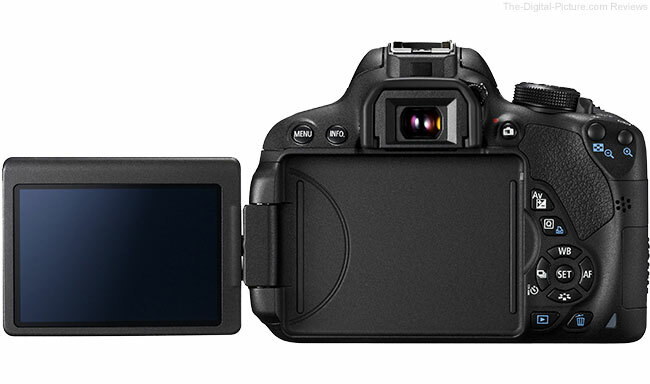 As noted in the first chart in this review, the T5i viewfinder provides 95% coverage. You are going to have a little more subject in your image than you see in the viewfinder. I seldom hear people complaining about this - you get used to it. But you might need to crop or clone stamp out something unintentionally present in your image during post processing if you are not careful. Typically using 100% viewfinders, I find the 95% finders slightly annoying when reviewing images later. No surprise here – the T5i looks just like the T4i. Like the Rebel T4i, the Rebel T5i receives Canon's excellent, best-currently-available, Vari-angle Touch Screen 3.0" Clear View II LCD. I really appreciate the vari-angle feature and the varied perspectives it enables me to capture. With the LCD screen angled to your convenience, it is now easy shoot from high, low and other angles/positions that are far from convenient to use the viewfinder or non-articulating LCD from. The vair-angle feature is a portfolio enhancer. The closed-reversed LCD is well-protected from damage during transport, storage or even use (including protection from nose prints). The "Touch" part of the LCD name is an also-recent feature. Those using smartphones will feel right at home using the T5i's touch feature. Some examples of using touch include: Touching to select the focus point location in Live View. Pinch-to-zoom when reviewing images - and dragging to pan around a zoomed image. Jumping from one menu tab or option to a distant menu tab or option by touching that tab or option. Quick camera setting changes such as ISO - no need to click many times to go from a low ISO to a high ISO value - just touch the value. Practically all camera setting changes can be made using touch. Touch Shutter control (photo taken when touched point locks focus) is available. A significant percentage of the T5i upgraded features are visible in this comparison. First, notice the texture change on the T5i body compared to the T4i. Then notice the mode dial change. The new mode dial now has raised icons and rotates 360 degrees. Fewer options appear on the mode dial, but this is due to Night Portrait, Handheld Night Scene, and HDR Backlight Control modes becoming menu-selectable under the SCN (Special Scene) mode. That's it for the top-visible differences. For quick image capture that requires no thinking, Canon's fully-automatic, point and shoot Scene Intelligent Auto mode (green square+ mode) utilizes the EOS Scene Detection system to determine the type of scene being photographed and adjusts the camera settings to best capture your image. 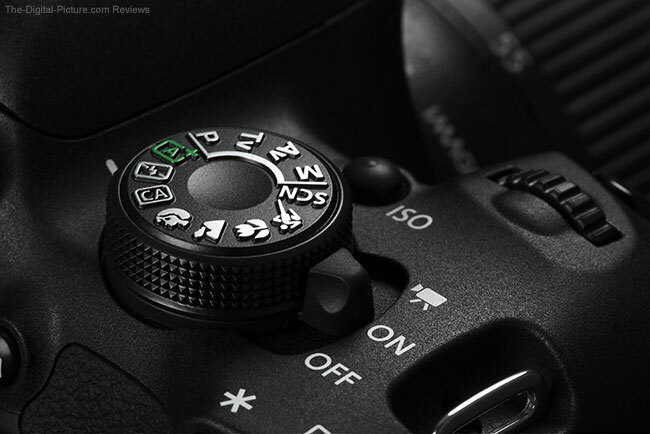 Other modes let you provide a range of input into the exposure decisions up to and including fully manual settings. As with the T4i, the T5i gets a pair of microphones located in front of the hot shoe for in-camera stereo recording capability. "Canon’s fun range of Creative Filters" (they're not my thing) are once again available. Size is of course one of the biggest reasons to select the EOS T5i as your DSLR choice - for either your primary, secondary or backup DSLR. There is little difference in size or weight among the Rebel models other than the Rebel SL1. I see no reason to select any other current DSLR for weight reasons. The DSLRs shown below are aligned approximately on their hot shoes. The T5i sides essentially remain unchanged from the T3i. Canon does not make any boasts about shutter life in its Rebel models. My wild guess is that the T5i's shutter durability rating is in the 50-100k range - likely on the low end of that range. The Canon EOS Rebel T5i / 700D receives a DIGIC 5 processor speed that approximately six times faster than the DIGIC 4..
Canon's Rebel-series cameras generally receive slower frame rates and more-shallow frame buffer depths, but the T5i once again receives 5 fps capability. This the best-ever frame rate for a Rebel model (tie with the T4i of course). The shutter lag time is again short relative to the older Rebel models. Point and shoot users taking their first picture with the T5i will think that it is lightning-fast and those used to a 1-Series body will think the T5i feels sluggish. While this impression is based on user experience, the truth is that the Rebel cameras have not been the ideal camera for capturing critical fast action, partially due to the relative slowness of the shutter and the relatively slow frame rate. The T5i's 5 fps frame rate and 75ms shutter lag is a definite step up from the T3i-and-prior Rebel models, making this camera a somewhat better choice for fast action capture. To test burst rate, I shoot in M mode (wide open aperture, fastest-available 1/4000 shutter speed), ISO 100, MF, IS off, lens cap on, and all noise reduction off. Testing in this method delivers, from a T4i, a 6 shot RAW burst in exactly 1 second followed by additional frames every .3 seconds for a count of four and then a frame about every .6 seconds. While the T4i can capture 30 JPGs before filling its buffer, the 1 second, 6 frame RAW burst goes very fast. Just sayin. The T5i/T4i has a quiet shutter sound to go with its discrete size. Here are the MP3 clips (from the T4i). The Canon T5i uses the same battery as the T4i, T3i and T2i - the small 1120mAh/7.2VDC Lithium Ion Canon LP-E8 Battery Pack. Canon rates the LP-E8 + T4i combination for up to 550 (440 w/ flash) shots. Battery life of course varies greatly with temperature, flash use Live View use, etc. The T5i tracks 4 levels of battery charge on the rear LCD. Want more battery life? Shoot in portrait orientation a lot? Want more control over your camera? Get a Canon BG-E8 Battery Grip as shown mounted on a T5i above. The BG-E8 accepts two LP-E8 batteries (or 6 readily available AA batteries in the included tray). Better yet, the BG-E8 provides a complete vertical grip with the appropriate buttons. The BG-E8 adds a lot to the size and weight of the T5i but it definitely makes the small body easier to control. It is easily installed or removed to give you the best of both worlds. The Canon EOS Rebel T5i / 700D is compatible with the small, inexpensive Canon wireless remotes including the Canon RC-6 Wireless Remote. Want to be part of your own family picture? Or just don't want to deal with a remote release cord? This is the accessory you want. Flip the LCD around and you can even see yourself in the frame. Obvious from the picture above, the T5i has a built-in flash - like all of the Rebel models before it. 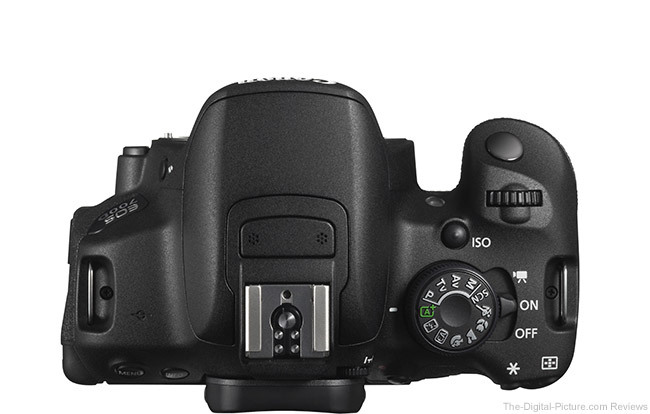 Like the EOS 7D, 60D, T3i and T4i, the T5i contains an Integrated Speedlite Transmitter. Use the built-in flash to control remote flashes for ultimate flash image quality. No external flash controller (such as the Canon 580EX II Flash and Canon ST-E2 Speedlite Transmitter) is needed to completely control as many remote flashes as desired. Using one of 4 available channels, the T5i can take complete control of multiple groups of flashes with ratios of up to 8:1. Flash settings are controlled from the T5i's menu which includes an extensive range of controls for both the built in and remote flashes including an EasyWireless or CustWireless option and up to ±2 stops of FEC (Flash Exposure Compensation). Note that missing in this master flash implementation is the High Speed Sync feature. The Integrated Speedlite Transmitter feature alone, if needed, will save you the purchase of a device with a significant cost - and the convenience factor of having this feature built-in is huge. 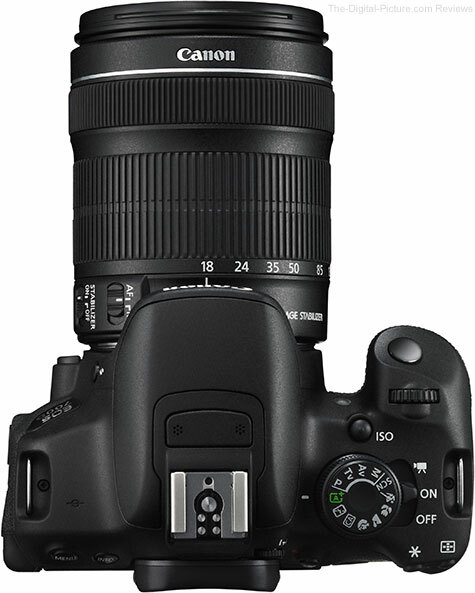 The T5i is, at review time, available as a body-only or in a kit with the Canon EF-S 18-55mm f/3.5-5.6 IS STM Lens or the Canon EF-S 18-135mm f/3.5-5.6 IS STM Lens. The 18-55 IS STM kit lens is decent and is a good value when purchased in the kit – and as I said earlier, a good upgrade from the previous 18-55mm kit lens. The 18-135 IS STM lens costs more, but is also a better lens with, obviously, a longer focal length range. 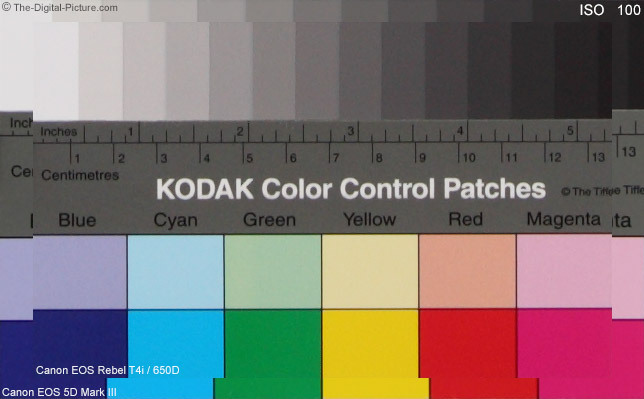 DSLR image quality is only as good as the weakest link in the imaging system. And the weakest link is often the lens. The quality of the lens makes a big difference in the image quality realized by any camera. I strongly recommend buying (now or later), one of the better Canon general purpose lenses available. As of review time, the Canon EF-S 17-55mm f/2.8 IS Lens, Canon EF-S 15-85mm f/3.5-5.6 IS Lens, Canon EF 24-105mm f/4 L IS Lens and the and Canon EF 24-70mm f/2.8 L II Lens are my most-recommended general purpose lenses for the Rebel T5i. When you buy a camera, you are also buying into the company behind it. I have been very satisfied with the support Canon's USA division has provided to me. When I call for support, I get an intelligent person who sincerely wants to help me with whatever my question or problem is. Repair service, though I have seldom needed it, is fast and reliable. This review is not a complete description of every Rebel T5i feature available. Check out the 388 page owner's manual (link at the top of this review) to get to know all of the features this camera has available. One reading will not likely suffice for beginners (for many topics at least). Read it, go use your camera, repeat. The manual will tell you all about features such as Auto Lighting Optimizer, Chromatic Aberration Correction, Peripheral Illumination Correction, remote control via a USB-connected computer, the Self-cleaning Sensor (shown below), the built-in flash, High ISO Noise Reduction, Long Exposure Noise Reduction, Highlight Tone Priority ... and many, many other topics. Not surprisingly, my advice for purchasing the T5i is very similar to what my advice for purchasing the T4i was. The T5i is a very minor upgrade to the T4i. Few T4i owners will find significant value investing in the T5i’s upgraded features. My upgrade advice from T3i and prior models remains the same as with the T4i. For someone buying their first DSLR or upgrading from a couple of models back, features such as the improved AF, Vari-Angle Touch LCD Panel, Movie AF, built-in flash controller, etc. make the T5i (or T4i) the camera to own - and worth the price premium over previous models. 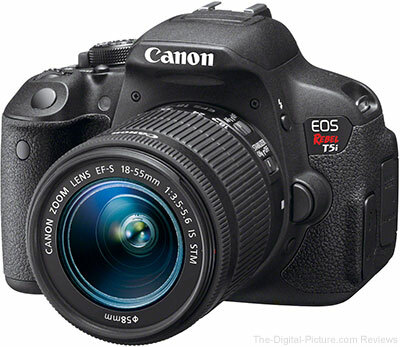 The Canon EOS Rebel T5i / 700D is an excellent choice for someone moving up to a DSLR from a smaller, less-capable camera and an especially great upgrade for anyone shooting with a two or more-generation old Canon EOS Rebel ***/***D body or from any Canon EOS Rebel **/****D body (such as the XS/1000D). 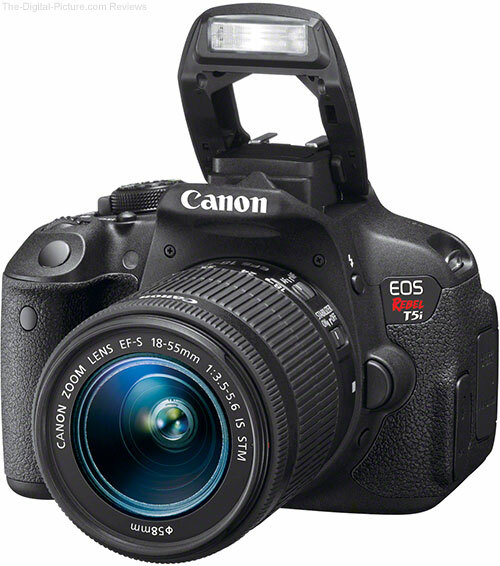 For an even smaller DSLR option, consider the Canon EOS Rebel SL1. The SL1 gives up the 9 cross-type AF points – and much size & weight. The SL1 has Canon Hybrid CMOS II AF that makes use of a larger portion of the LCD – an especially nice advantage when recording video. 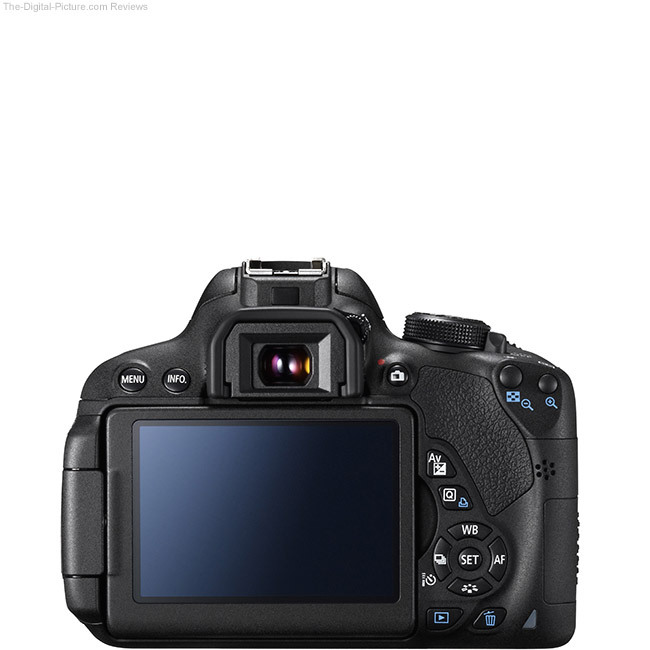 The 60D, at this time, is less expensive than the T5i. You get all of the benefits for less expense. The modestly larger size and weight of the 60D will not be seen as a benefit to everyone or for every purpose. 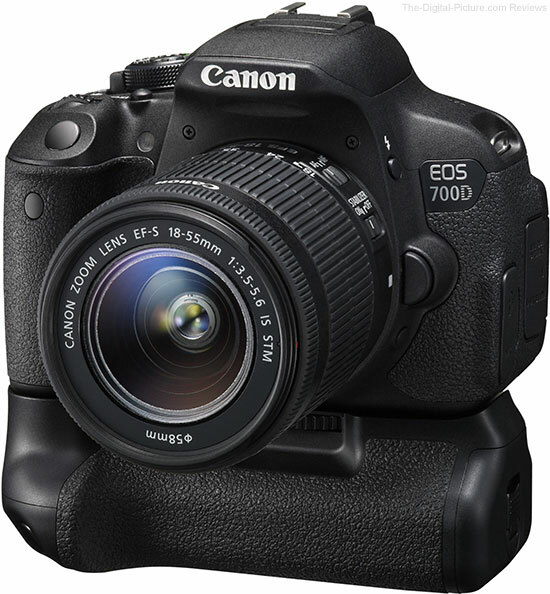 Just announced at Rebel T5i review time is the Canon EOS 70D. While the 70D's Dual Pixel CMOS AF is getting most of the attention, it is the upgraded AF system that excites me the most. The 70D sports the 7D's AF system. The 70D, overall, is a serious upgrade from the 60D. But, the upgrade cost from the T5i to the 70D makes this decision more than a no-brainer. 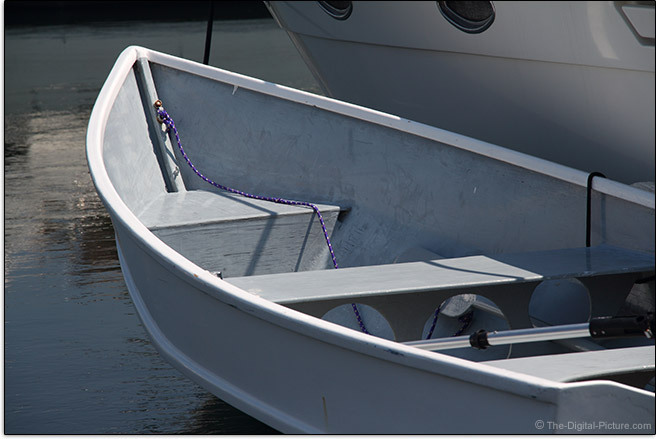 The sample image above was captured in Kennebunkport, Maine using a T4i and Canon EF-S 18-135mm f/3.5-5.6 IS STM Lens. Settings were 135mm, f/8, 1/160 and ISO 100. The T5i has taken over the flagship position in the Rebel line from the T4i. But not by much. The T5i appears to be more of a name change than an upgrade – and perhaps the name should have been T4iN. Again, this review was performed hands-off due to the overwhelming similarity between the T5i and T4i. If it was priced much lower than the T5i, I would simply get the T4i. But, the T5i now has the lower price tag. I see no reason not to simply buy the latest model. Again, the Canon EOS Rebel T5i / 700D delivers 18 megapixels of professional grade image quality in a compact, lightweight, feature-filled, easy-to-use body that carries a very affordable price tag. It is a great starter camera. It will work very well for a seasoned pro that need a small and light camera.